THE ZETA CHI PIKELINE 3 T he chapter continued to thrive this past semester, achieving a GPA of 3.22, 1,217 service hours, and 11 educational events, ranking second among all other Missouri State fraternities. New events and exciting developments have set up 2018 for success. MEMBERS SPEARHEAD NEW EXECUTIVE POSITION The chapter developed a new executive position, chief marketing officer, in order to consistently present a clear image of the fraternity to the campus and community. This new position was discussed with Chief Marketing Officer Brent Phillips at the 2018 Pike Executive Conference. Next year Zeta Chi will be taking detailed notes and provide programming reports of the new position for review. This will possibly be implemented for all Pike chapters. Joe Barbagallo '15 was elected to this new position and is excited for how this marketing-focused executive position will impact the Pike image. ZETA CHI TO HOST LARGEST FIREMAN'S CHALLENGE Over the past year, Philanthropy Chairman Graham Nave '15 has been developing the largest Fireman's Challenge yet. It will be a weeklong event beginning Tuesday, April 10, with a Fireman Cook-Off. The events occurring throughout the week will consist of competitive and educational events engaging all FSL and campus life. The main event will take place Saturday, April 14, which will have obstacle courses, games, live music, inflatables, and more. Fire departments around the area will be in attendance as well as community, FSL, and campus members. 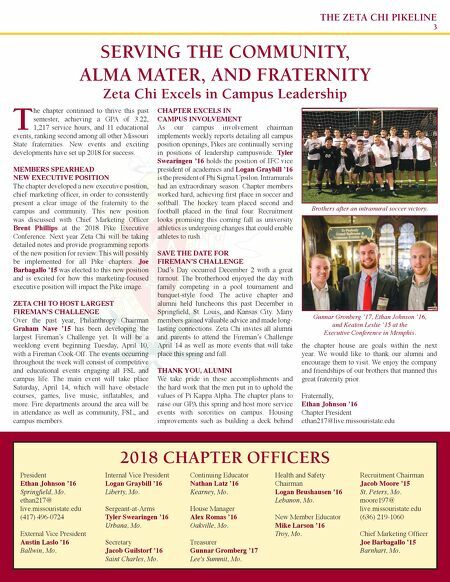 CHAPTER EXCELS IN CAMPUS INVOLVEMENT As our campus involvement chairman implements weekly reports detailing all campus position openings, Pikes are continually serving in positions of leadership campuswide. Tyler Swearingen '16 holds the position of IFC vice president of academics and Logan Graybill '16 is the president of Phi Sigma Upsilon. Intramurals had an extraordinary season. Chapter members worked hard, achieving first place in soccer and softball. The hockey team placed second and football placed in the final four. Recruitment looks promising this coming fall as university athletics is undergoing changes that could enable athletes to rush. SAVE THE DATE FOR FIREMAN'S CHALLENGE Dad's Day occurred December 2 with a great turnout. The brotherhood enjoyed the day with family competing in a pool tournament and banquet-style food. The active chapter and alumni held luncheons this past December in Springfield, St. Louis, and Kansas City. Many members gained valuable advice and made long- lasting connections. Zeta Chi invites all alumni and parents to attend the Fireman's Challenge April 14 as well as more events that will take place this spring and fall. 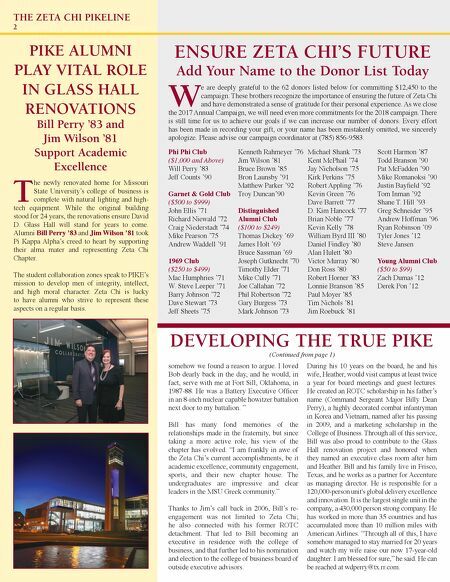 THANK YOU, ALUMNI We take pride in these accomplishments and the hard work that the men put in to uphold the values of Pi Kappa Alpha. The chapter plans to raise our GPA this spring and host more service events with sororities on campus. Housing improvements such as building a deck behind the chapter house are goals within the next year. We would like to thank our alumni and encourage them to visit. We enjoy the company and friendships of our brothers that manned this great fraternity prior. Fraternally, Ethan Johnson '16 Chapter President ethan217@live.missouristate.edu SERVING THE COMMUNITY, ALMA MATER, AND FRATERNITY Zeta Chi Excels in Campus Leadership Gunnar Gronberg '17, Ethan Johnson '16, and Keaton Leslie '15 at the Executive Conference in Memphis. Brothers after an intramural soccer victory. 2018 CHAPTER OFFICERS President Ethan Johnson '16 Springfield, Mo. ethan217@ live.missouristate.edu (417) 496-0724 External Vice President Austin Laslo '16 Ballwin, Mo. Internal Vice President Logan Graybill '16 Liberty, Mo. Sergeant-at-Arms Tyler Swearingen '16 Urbana, Mo. Secretary Jacob Guilstorf '16 Saint Charles, Mo. Continuing Educator Nathan Latz '16 Kearney, Mo. House Manager Alex Romas '16 Oakville, Mo. Treasurer Gunnar Gromberg '17 Lee's Summit, Mo. Health and Safety Chairman Logan Beushausen '16 Lebanon, Mo. New Member Educator Mike Larson '16 Troy, Mo. Recruitment Chairman Jacob Moore '15 St. Peters, Mo. moore197@ live.missouristate.edu (636) 219-1060 Chief Marketing Officer Joe Barbagallo '15 Barnhart, Mo.